Vendor - Tiffany & Co. Markings - Tiffany & Co, 925. Width - 6mm. Purity - 925;. Material - Sterling Silver;. Length - 16". Ending Apr 21 at 7:00PM PDT1d 5hMetal: Sterling SilverStyle: ChainLength: 16 - 17.99"
Where do we get all our Tiffany & Co Pieces???. F ake pieces are destroyed and sold for scrap, and anything in need of repairs goes to our jeweler. 2.5mm beads. 15.75 grams 925 sterling silver. Tiffany & Co. Sterling 36” Bead Necklace w/ Heart Pendant EXCELLENT CONDITION! Guaranteed authentic Tiffany & Co. bead necklace is 36” L. Tiffany & Co. hallmarks. Box not included. EXCELLENT CONDITION! From smoke free pet free home! Please bid in confidence! Payment is due within 1 day of auction close per contract listing terms. 100% Authentic Tiffany & Co. Graduated ball bead necklace sterling silver. Guaranteed authentic Tiffany & Co. Graduated bead ball necklace is 16”L. Tiffany & Co. hallmarks. Box not included. EXCELLENT CONDITION! From smoke free pet free home! Please bid in confidence! Payment is due within 1 day of auction close per contract listing terms. Ending Apr 23 at 6:00PM PDT3d 4hMetal: Sterling SilverBrand: Tiffany & Co. It is marked T & Co 925. It has a woven design. A great addition to any collection. Ending Apr 23 at 6:14PM PDT3d 4hMetal: Sterling SilverBrand: Tiffany & Co.
Tiffany & Co. Sterling Silver Roman Cross Pendant Bead Necklace 16.25 inch. Condition is Pre-owned. The Tiffany cross comes with a sterling silver necklace. Total gram weight is 14.18gr All my items are guaranteed to be 100% authentic and ship from a smoke free house Shipped with USPS First Class Package, original Tiffany box is included. Beautiful piece to start or add to a Tiffany collection! Where do we get all our Tiffany & Co Pieces???. F ake pieces are destroyed and sold for scrap, and anything in need of repairs goes to our jeweler. Necklace is 16" with 2 " extension. Ending Apr 22 at 6:30PM PDT2d 4hMetal: Sterling SilverStyle: PendantBrand: Tiffany & Co. This 100% authentic Vintage Tiffany & Co. Sterling Ball Necklace is beautiful. Left in its current condition because most of you guys prefer older Tiffany to stay aged to perfection, as opposed to being shined up. Besides the natural coloring condition this necklace is in great condition! The necklace is 16.25” long. Box and pouch not included. Shipped with USPS First class. This style necklace is becoming harder and harder to find. Ending Today at 5:50PM PDT4hBrand: Tiffany & Co.
Tiffany & Co. Sterling Silver Chain. Hallmarked: Tiffany & Co. 925. 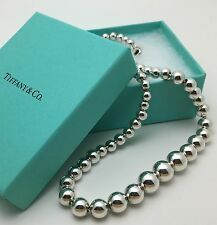 Up for sale is a beautiful sterling silver Tiffany & Co sterling silver ball bead chain necklace. Don't miss out on this beautiful Tiffany & Co silver ball bead chain necklace. It would make a great addition to your jewelry collection. Tiffany & Co. Sterling Silver Atlas Dog Tag Pendant Bead Chain Necklace 16"
Tiffany & Co Bead. Silver Necklace Ball Bead. Return To Tiffany Love. Tiffany & Co Bead. Silver Necklace Ball Bead. Tiffany Beaded. Condition is new. This was an unwanted gift. Comes with box. Tiffany & Co. Graduated Bead Ball Necklace 100% AUTHENTIC! 100% Authentic Tiffany & Co. Graduated Bead Ball Necklace. This necklace features a string of sterling silver spheres in a variety of sizes. Here are the details from the site Sterling silver. NEW Tiffany & Co Sterling Silver Bead Ball Graduated Pendant Necklace 16"
NEW Tiffany & Co Sterling Silver Bead Ball Graduated Pendant Necklace 5 graduated beads on a silver ball chain 16” long laid flat 9.5” from clasp to end of last bead when closed Comes in original box and pouch Was gently cleaned as been sitting for while-never worn. Ending Apr 22 at 9:47AM PDT1d 19hMetal: Sterling SilverStyle: PendantLength: 16 - 17.99"
Graduated beads ranging from 6mm-11mm. Authentic Tiffany & Co. Tiffany & Co. 925. Tiffany & Co Pouch is Included. Ticket Number: 0093. Marked: TIFFANY&Co / 925. Style: Necklace. Size(Approx): Chain:33.8" (86cm). Color: Silver. S Never used Like new/MINT ,unused condition. 1 Junk Junk condition, in need ofrepair. From JapanMetal: Sterling SilverStyle: PendantLength: 30 - 35"
Stunning 925 Tiffany & Co. Solitaire Barrel Bead Double Strand Necklace Rare 16"
Stunning and very rare Tiffany & Co. double strand solitaire barrel bead chain necklace. I have cleaned this item to the best of my ability and it is ready to wear. Note: Item 1151, case 4. F ake pieces are destroyed and sold for scrap, and anything in need of repairs goes to our jeweler. Where do we get all our Tiffany & Co Pieces???. Total weight is 21.8 grams 925 sterling silver. 2.5mm beads. Tiffany pouch included! Tiffany box not included. Authentic Tiffany & Co Necklace. This necklace is pre-owned in excellent condition, has been authenticated and professionally polished; however as you see in the photos it is in very good and ready to wear. Tiffany & Co. Sterling Silver Graduated Bead Ball Necklace 16". TIFFANY & CO. ESTATE STERLING SILVER SOLID PEAR SHAPE BALL CHARM NECKLACE 20"
TIFFANY & CO. This EXQUISITE sterling silver Necklace is has a 14 x 18 mm SOLID PEAR SHAPE BALL CHARM hanging from the 1 mm 20" Rolo Chain. It has a Spring Ring clasp for it's closure. Both the Pendant & Chain are Hallmarked: TIFFANY & CO.
Metal: Sterling SilverStyle: PendantLength: 20 - 21.99"
Tiffany & Co Barrel Bead Station Necklace. Marked Tiffany & Co 925. Sterling silver. You can rest assured that your order will make it there in one piece. · We operate in Ocean County, New Jersey. You must also ask for a quote before purchasing. Tiffany & Co Sterling Silver 10mm AG925 Bead HardWear Necklace. Hallmarked on dangle disk :Tiffany & Co- AG925. All beads are strung on a secure triple reinforce chain. New in Box. Metal: Sterling SilverFeatures: Lobster ClaspLength: 18 - 19.99"
TIFFANY & CO. 16" Tiffany bead ball chain. Tiffany pouch included. Chain hallmarks: Tiffany & Co. 100% Authentic & Retired! Tiffany & Company Sterling Silver 1837 Dog Tag & 18 Inch Ball Necklace. Condition is Pre-owned. Shipped with USPS First Class Package. F ake pieces are destroyed and sold for scrap, and anything in need of repairs goes to our jeweler. Where do we get all our Tiffany & Co Pieces???. Total weight is 25.5 grams 925 sterling silver. Tiffany & Co Necklace. Graduated ball bead. Marked Tiffany & Co 925. Sterling Silver. You can rest assured that your order will make it there in one piece. · We operate in Ocean County, New Jersey. Our Policy. It’s in mint condition with minimal wear. This have been professionally cleaned and polished to look new. Don’t forget to checkout our other Tiffany products for matching jewelry. We reserve the right to choose. TIFFANY & CO GRADUATED BEAD BALL STERLING SILVER NECKLACE PERFECT!!!! Authentic Tiffany and Co Return To Tiffany Heart Bead Necklace EUC 18 In. Both heart and chain are authentic and are hallmarked. Great to excellent used condition. Normal minor scratches, Beautiful Authentic Tiffany and Co. 1 inch silver heart with an 18 inch bead necklace.No box or dust bag included. Last 2 pictures are to show size in comparison to a quarter. (This is a medium size heart which is the size of a quarter. 1 inch tall) Please ask any questions before bidding as I take no returns. ALL SALES ARE FINAL! I do combine shipping. Payment due within 2 days of end of auction. Please look at the other items I have for sale. Thank you for looking and happy shopping. Ending Apr 21 at 11:16AM PDT21h 27mTheme: Love & HeartsBrand: Tiffany & Co.
F ake pieces are destroyed and sold for scrap, and anything in need of repairs goes to our jeweler. How do we have so many Tiffany & Co Pieces???. Total weight is 25.6 grams 925 sterling silver. 2.5mm beads. Tiffany & Co ladies 16" graduated bead necklace, weighing 27.7 grams in total Comes with Tiffany felt pouch, Tiffany box and Tiffany carrying bag. Beads measure 6mm at the smallest to 11mm at the largest. Comes with round Tiffany ID tag. Stamped 925. F ake pieces are destroyed and sold for scrap, and anything in need of repairs goes to our jeweler. Where do we get all our Tiffany & Co Pieces???. Total weight is 26.2 grams 925 sterling silver. Authentic Tiffany & Co. sterling silver necklace. Graduated bead balls. Beads are 6 mm-11 mm in size. Includes the original Tiffany pouch, box, ribbon, and bag. Everything you need for the perfect Valentine's gift. 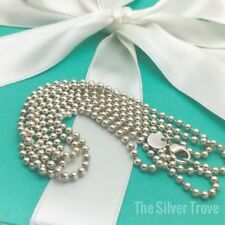 Here is a gorgeous Authentic Tiffany & Co. HardWear Collection Sterling Silver Graduated Bead Necklace, that will come with a Tiffany Box, and a Current Retail of $450.00 plus Tax. This is a classic design by Tiffany, that has been around for awhile now, done in their signature high polished Sterling Silver. The bead balls graduate in size from 6mm in the back, to 11mm in the front, with an easy to use large lobster claw clasp, and a little round Tiffany hallmark tag at the end. It measures 16 1/4" from end to end and stung on a Sterling Silver link chain, with some play between the beads.The necklace is Hallmarked "(c) Tiffany & Co.~925" on the round disk, and "925" on the lobster claw clasp, and it weighs approximately 28.7 grams. It is in great condition, with minimal signs of use. Excellent condition set of Tiffany & Co. silver beaded necklace. Marked 925 and Tiffany & Co. on the reverse. 94 x 10mm sterling silver beads. It is marked 925 Tiffany & Co and weighs 22.2 grams. Pouch and Gift Box. Plus, the current version attaches the pendant using a jump ring, so it lays facing forward (necessary since the shorter chain makes the pendant rest below the collar bone rather than hanging to sternum on the longer chain). Tiffany & Co 925 sterling silver 10 strand 2mm bead necklace with a wide hook clasp. Necklace can be worn as a srand nckace or a torade. Weighs 70 grams. Tiffany & Co. pre-owned Tiffany & Co. Graduated Bead Necklace. Sterling Silver. Weight:46 grams. You are viewing a Tiffany & Co. 18k Yellow Gold Beaded 16in Necklace. Total weight is 40.1 grams. This necklace is in excellent condition. Stamped Tiffany & Co. 750. Ending Apr 26 at 11:36AM PDT5d 21hMetal: Yellow GoldLength: 16 - 17.99"Brand: Tiffany & Co.